This lesson focuses on how educators can use assessment data to identify students who are at risk for literacy difficulties. Part 1 gives an overview of the process for identifying students at risk for literacy difficulties as part of a response to intervention (RTI) framework. In Part 2, you will consider what instructional decisions are made when students are identified as at risk and the criteria used to make this determination. In Part 3, you will explore the issues of reliability and validity in using data to identify students who are, and are not, in need of literacy intervention instruction. RTI is often referred to as a preventative model because the aim is to identify students who are at risk for reading difficulties in the future by providing needed support early to help students before difficulties arise or get worse. At the heart of this process is assessment. Within an RTI framework, assessment takes many forms. Action Step A2 focuses on assessment for the purpose of identifying students at risk for literacy difficulties. This kind of assessment is commonly called universal screening. Literacy screenings are similar to medical screenings in many ways. They focus on key indicators of risk. For example, blood pressure screening is done at most doctor visits because blood pressure is one of the factors shown to indicate risk for coronary artery disease (heart disease), a major cause of death in our country. Doctors can identify patients who are at risk by reviewing blood pressure readings. If a patient has a reading outside the range determined to be healthy, the doctor can begin to take appropriate steps to address the patient's possible risk for heart disease. Without the blood pressure reading, the patient's condition would likely go undetected until it was much more difficult to treat. Similarly, reading screenings focus on skills that are related to a student's literacy development. For example, in the early grades, letter-naming fluency is often a target skill assessed because it has been shown to indicate future success in learning to read. Therefore, screening and identifying students who struggle with this skill as early as possible alerts school staff to begin intervening with these students before they fall behind their peers in their reading development. Within RTI, screening is called "universal" because all students are assessed. Just as the doctor will want her patients to have their blood pressure reading taken at least once every year, universal reading screening should also take place on a regular basis. In fact, experts agree that screening for reading difficulties should take place at the beginning of the year (BOY), middle of the year (MOY), and end of the year (EOY). Reading difficulties can develop during these intervals—especially during early literacy development—so it is important not to wait until late in the school year or until the next school year to assess students' target skills and intervene accordingly. If you do use formal screening assessments, they need to be relatively inexpensive and quick to administer. This is the case because of the need to administer them to all students. In order to produce valid and reliable results, the procedure for administration is standardized, and training for those who conduct the assessments is essential for the results to be as reliable as possible. Just as the nurse or assistant must learn to use equipment properly and listen for the systolic and diastolic pressures, whoever administers the literacy screenings at your school must be well trained in standardized assessment procedures and be able to demonstrate reliable assessment administration. A health screening can lead to lifesaving treatment. Similarly, screening students on target literacy skills and intervening with students who struggle with these target skills can lead to not only saving students' academic careers, but also ensuring they have the literacy skills needed for a happy and fruitful future beyond the classroom. The purpose of each assessment should be closely related to the instructional decision that will be made using the data from that assessment. The Action Steps in the Assessment component of the TSLP are organized around these purposes and provide a key reminder to educators to keep the purpose in mind when using assessment data. In the medical analogy, to save both resources and time, we would like our doctors to have in mind how they will use the results of tests they order for us. What are the data from this instrument used for? In other words, what decisions will be made based on this data? Are the criteria for this decision defined? If yes, are the criteria communicated to teachers and other stakeholders? Are the criteria implemented routinely? You can refer to the third column of the Assessment Audit form for this discussion. What decisions will be made based on this data? 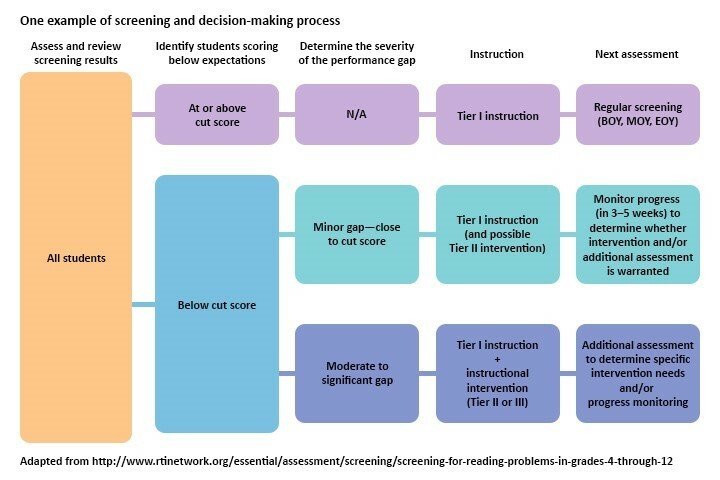 Students are identified as at risk based on their scores on the screening assessment compared to the expected level of performance for students in their grade level (i.e., norm-referenced). This expected level of performance is called a cut score. Cut scores (which will be discussed further in the next section) are used to identify which students are not at the target level for a particular skill. The severity of the gap between the cut score and a student's score should determine what steps you take next. As in the example, you may decide to simply monitor students who scored close to the cut score to see if Tier I instruction alone has sufficiently provided the support needed to get back on track for meeting end-of-year goals. For students who fall further below the cut score on the screening assessment, you may decide to conduct additional assessments to determine the students' specific intervention needs. This kind of assessment is the focus of Action Step A3 and is discussed in Lesson A3—Determining instructional needs. Throughout this process, teachers making decisions about how to intervene with students identified through the screening as needing additional support may want to look at additional data such as results from previous years (when available), English language proficiency, and educational history. Looking at multiple sources of information about a student's literacy achievement and needs is the most effective way to ensure valid data and valid decisions. The example mentioned above is just one way the decision-making process can work for using screening data. Some schools may do things differently, such as providing intervention instruction immediately to all students whose screening results place them in the at-risk level. There are acceptable variations in the implementation of RTI. The guiding principle is to use reliable data in valid ways to help students avoid or reverse the educational equivalent of heart disease: problems in reading that become more and more difficult to overcome as the years go by. What criteria will be used for these decisions? For screeners to be helpful, they have to classify students as either at risk or not at risk. The score that separates "at risk" from "not at risk" is the cut score (mentioned earlier) and is typically established by the publishers of the screening instrument. Some districts decide to set cut scores themselves if they feel the scores based on national norms do not reflect the local student population. The Center on Response to Intervention (2013) cautions, however, that "this process requires a sufficient sample of students and someone with statistical expertise to conduct the analysis" (Brief #2, p. 3). When implementing universal screening as a part of RTI, many schools find that the screening results identify large percentages of students in the at-risk category. This can occur for several reasons. Because the goal of screening within an RTI framework is to catch a gap between target skill levels and a student's performance that is just in the making—unnoticed in regular classroom performance—the cut scores tend to be more stringent than lenient. Test publishers, and most school leaders, would rather err on the side of identifying too many students than miss students who need assistance (Center on Response to Intervention, 2013, Brief #2, p. 3). If you do have a significant number of students who fall below the screening cut scores, it will be important to look at individual students and use other data sources, mentioned above, to help determine if they are at risk or if there may have been other issues interfering with either the students' performance or a reliable administration of the assessment. On the other hand, a large percentage of students scoring in the at-risk category may actually show a true picture—that there really are many students with gaps in key reading skills. This situation points toward a need for improvement in the general education classroom, for example, Tier I instruction in language arts. You may use this information for the purpose of evaluating your literacy instruction program, which is discussed in more detail in Lesson A5—Evaluating overall literacy performance. In both cases, a school with a large number of students identified as at risk will need to take a closer look using multiple sources of information to make decisions about how to best use its resources to help each student succeed. More complex than simple cut scores, decision trees show a series of questions or criteria to determine the best route to serving a student's instructional needs. The decision tree might unite the at-risk cut scores for multiple assessments, as described in this report. Or a decision tree may show the use of different kinds of data that inform the RTI process, such as in this locally developed process. One of the main advantages of decision trees is that they can integrate multiple sources of data into the process as they clearly outline the criteria to be used and the possible decisions that can be made based on those criteria. Decision trees can also help in prioritizing and differentiating among students when a large group is identified as at risk. Is this data valid for identifying students at risk? Is the data reliable? Is the instrument appropriate for students at this grade level and age? Is the instrument appropriate for all students' language proficiency and language of instruction? You can refer to the fourth column of the Assessment Audit form for this discussion. An important source of information for this discussion is the instruction manual for each assessment. Publishers typically provide descriptions of the intended use and application of the assessment instruments. To obtain data that is valid, the construct of the instrument should match your purpose—in this case, to identify students at risk. You can also use the screening tools chart from the Center on Response to Intervention, accessible from the link in the To Learn More section below, to learn about the reliability, validity, classification accuracy, and other features of many commonly used screeners. Test administration, scoring, and data management are the main concerns with regard to reliable data (Center on Response to Intervention, 2013, Brief #4). An inconsistency in the administration of screeners can seriously compromise your ability to identify students in need of intervention. As mentioned previously, regular training for everyone who administers screeners should be mandatory. Again, refer to the assessment manual for guidance. For assessment instruments that require some subjective judgment, you may consider more intensive trainings that include mock testing and feedback. Such training may be available through the test publisher. Training is also needed to avoid inconsistencies in scoring. To avoid unintended bias, your process could include replacing student names with ID numbers or, when possible, assigning evaluators who are unfamiliar with the students whose assessments they are scoring. Providing written scoring procedures, guidelines, and rubrics can also help address this issue. Where might human error take place? If scores are manually entered into a system at some point, how can you test samples to check for accuracy? What procedures could help ensure accurate data entry? What might necessitate verifying the scores for an individual or group of students, and how might you do that? Finally, your team will need to consider the appropriateness of each assessment for the age and languages of your students. Typically, screeners for the elementary school level identify the age or grade level at which they are designed to be used. If your staff is following these guidelines and screening all students in each grade with the same instrument, you can check this item off in your audit. Experts encourage using the same screening processes for English learners that are used for their English-proficient peers, but you may need to look at the data differently (Echevarria & Hasbrouck, 2009; Esparza Brown & Sanford, 2011). Research suggests that using screening data together with other sources of information about the English learners' ability to learn and rate of learning may be a more accurate way to identify English learners who are and are not in need of literacy intervention beyond linguistically supportive and differentiated Tier 1 instruction (Project ELITE, Project ESTRE2LLA, & Project REME, in press). Within the extensive website of the Center on Response to Intervention is a section dedicated to universal screening. Online modules and articles, several cited in this lesson, can be accessed from the Resources bar. One of the many resources there is the center's Screening Tools Chart. Discuss how screening data is used to make instructional decisions and how you ensure the validity of the data. You may use the third and fourth columns of the Assessment Audit as described in Part 2 and Part 3 of this lesson. Gather and review the administration manuals and procedures for each screening assessment used at your campus. Determine which staff members have been trained in administering and scoring the various assessments used at your campus. Determine procedures for gathering and sharing additional data to support valid decisions for English learners. With your site/campus-based leadership team, review your team’s self-assessed rating for Action Step A2 in the TSLP Implementation Status Ratings document and then respond to the four questions in the assignment. Refer to Part 1 for an overview of the process of identifying students at risk for literacy difficulties. Refer to Part 2 for information about the instructional decisions and criteria used in identifying and addressing the needs of students at risk. Refer to Part 3 for information about reliability and validity in identifying students who are, and are not, in need of literacy intervention instruction. Next Steps also contains suggestions that your campus may want to consider when you focus your efforts on this Action Step. Project ELITE, Project ESTRE2LLA, & Project REME. (in press). Assessment and data-based decision making within a multitiered instructional framework. Washington, DC: U.S. Office of Special Education Programs.